Do you ever have that intense desire to completely do over an entire part of the garden? But before you can give in to this extreme act, sound reason gilded with just a trace of lethargy steps in? I hope you know what I’m alluding to because I’d hate to think I’m alone in madcap thoughts. 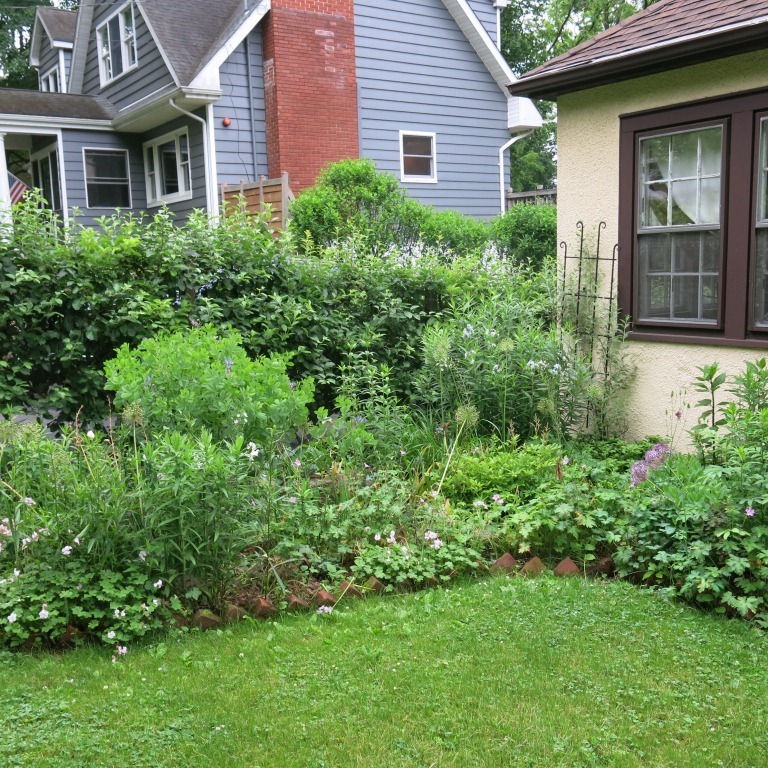 Each year about now when spring is transiting to summer and again, when fall is barely edging out summer, I can’t stand the front perennial beds. They look kinda meh! if you get my drift. The blooms of printemp that shone so gaily are dimming their lights but the flowers of summer have yet to hear their cue. There is no doubt a lush greenness present but the oomph is missing. In the broadcast world this would be described as dead air and something to avoid at all costs. In the garden design world this is not quite as serious but still a situation to prevent. If possible. The problem is, nature has a mind of her own. No amount of careful planning will entirely eliminate the problem. In fact, my careful orchestration is happily ignored all too often. This year being no exception. Nothing followed anticipated patterns. It worked out okay except for now – unhappily, true to form, the perennial beds are pretty much doing nothing for my morale. 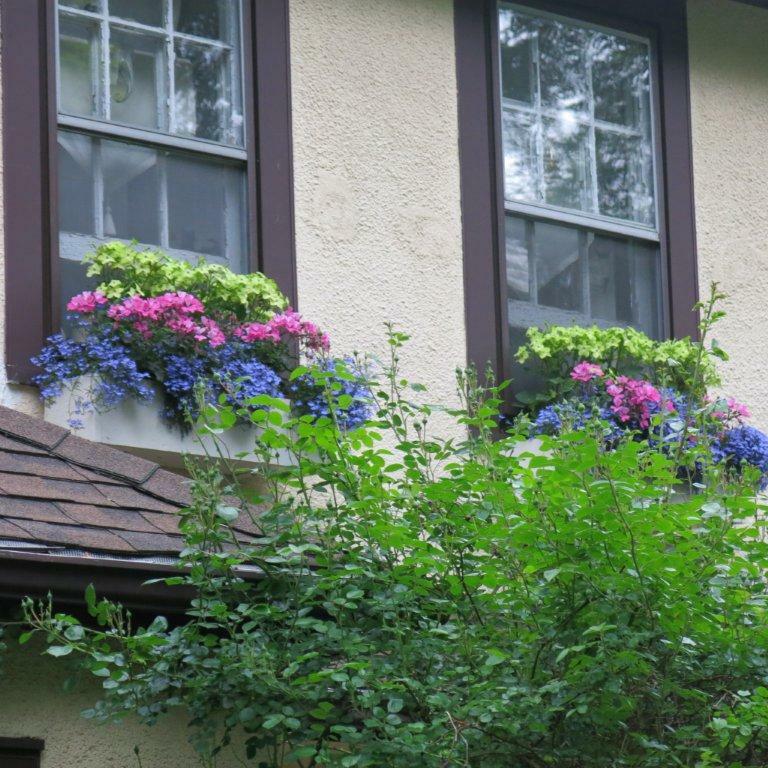 I could use some annuals and maybe I will but, I’d still prefer to rely mostly on perennials. I had high hopes for the rose on the front arch. Being late to bloom this season, for once, I guaranteed myself a seamless transition to summer. The arch would carry us till the phlox and acanthus made their appearance. But recent thunderstorms put paid to that dream. The cascade of soft pink roses now hang limp and tired, shedding petals resembling bits of brown paper. Back to square one. There is nothing to hold ones attention in the front garden. 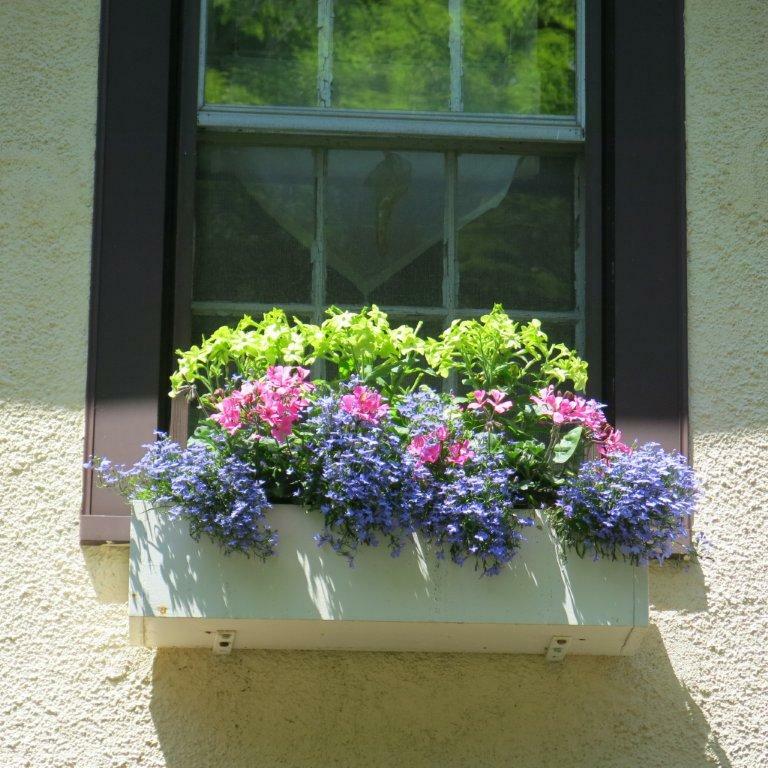 The window boxes are trying but it is unfair to think they must carry the whole front. Clearly, something for this specific time is required. I’m flummoxed because in the past, everything I have planted for this purpose has turned traitor. They have all chosen an earlier or later time to bloom in my garden. But, I’m not ready to surrender. I think I’m being challenged. If the garden has taught me anything, it is to never give up. As long as there is life, there is hope. A trip to the nursery is in short order. Stay tuned. Perhaps I’ll run into some of you there? The beds are just all green. You see? This entry was posted in Deep thoughts, Move It, Seasons Greetings by shobha. Bookmark the permalink. Was just thinking something similar looking at my predominantly green perennial garden. I’m made of weaker stuff than you, so will no doubt cheat with annuals. Of course, there are great swaths of green now, but I always look for variegated or neon green herbs to break it up a little. I like variegated calamint for that reason. Since reading this post, I’ve been wanting to share the colorful stuff now in my garden: pinks, cliome and hyssop.